SAWS offers assistance to customers who need help paying for water and sewer services. Thousands of local residents rely on assistance from the San Antonio Water System (SAWS) to pay their water and sewer bills, recent data from the utility shows. SAWS offers assistance to customers who need help paying for water and sewer services, including an Affordability Discount Program, which offers discounts between $4.62 to $24.50 per month based on income and household size, as well as discounts for senior citizens and those with disabilities. 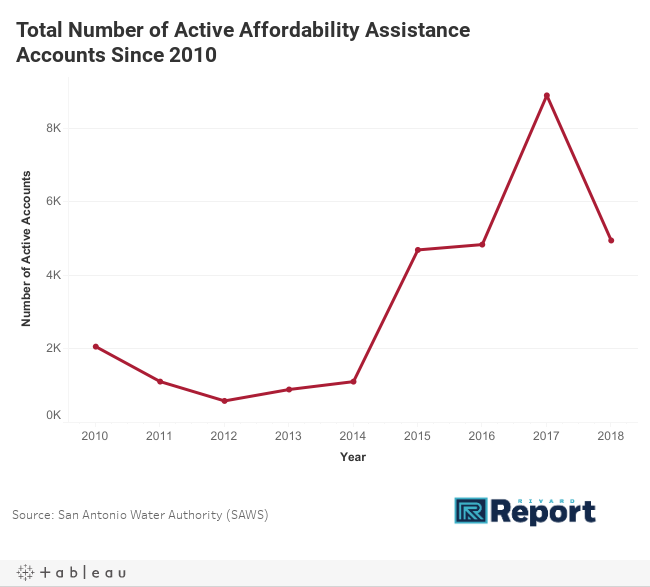 The anonymized data, released to the Rivard Report by SAWS, shows active and new affordability assistance accounts for residential properties since the start of the affordability assistance programs in 2010. 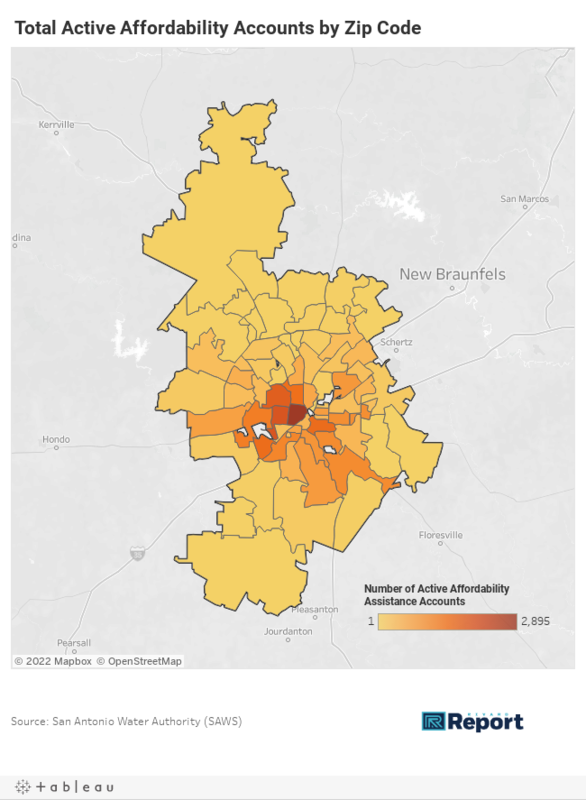 Since 2010, nearly 30,000 affordability assistance accounts were opened in San Antonio, the data shows. The total number of active affordability assistance accounts increased by 140 percent since 2010 to September 2018, from 2,061 to 4,944, according to the data. The total number of accounts peaked in 2017 when 8,886 accounts were active. The map below shows the total number of affordability assistance accounts opened since 2010 for each zip code. In 78207, west of downtown, 2,895 affordability accounts were opened since 2010 – the largest number for any zip code in the city. Several Westside neighborhoods also show high numbers of affordability assistance accounts relative to other neighborhoods. The rise in the number of people applying, and qualifying for, affordability assistance could be due to SAWS’s recently revamped outreach efforts to residents having difficulty paying their bills, said Gavino Ramos, vice president of communication, external affairs, and conservation at SAWS. Water affordability is not only a local problem, it’s also a national concern for water utility systems that raise rates to keep up with the costs of maintaining aging infrastructure or introducing new water sources. Earlier this year, the Brookings Institution reported the average monthly residential water bill rose by 50 percent since 2010, a faster rate than incomes, as a result of increasing infrastructure costs for water utilities. That puts many at risk of no longer being able to afford their utilities bill, according to a 2017 study published by Michigan State University in PLOS One, a peer-reviewed science journal. The study found 23.5 percent of all U.S. households are at risk of being unable to afford water rate increases. The study ranked Texas 22nd out of 49 states for the highest percentage of census tracts in which large proportions of the population are facing difficulty paying for water utilities. In December 2017, City Council approved a 5.8 percent water rate increase for 2018, and a 4.7 percent increase in 2019 – an average increase of $6.39 over two years. Ramos said SAWS addresses affordability issues created by rate increases by ensuring the budget for affordability assistance programs grows at the same rate. The Michigan State study found several “high-risk” and “at-risk” census tracts in San Antonio where median incomes are not high enough to afford future increases in water rates. High-risk areas track to much of the city’s inner urban areas, the far South Side, and a couple pockets on San Antonio’s North Side, according to the study. In October, SAWS plans to unveil a new program aimed at simplifying the application process for affordability assistance. The project, called “Uplift,” will allow SAWS to determine applicants’ eligibility for several programs based on a universal application, rather than requiring a separate application for each program. Ramos said the program will improve the efficiency of SAWS’s outreach and bring greater awareness to the parts of the city where residents need the most support. Great report. I’m curious to know how many of those in need are illegal aliens? Dude, “illegal aliens” is not the preferred nomenclature … “undocumented migrants” please. Good article! Note the rate charged increases with consumption. The first 2992 gallons cost only $0.074 per 100 gallons, but every 100 gallons over 20,199 gallons costs $0.4809 (a factor of 6.5). That’s true, but water is actually cheapest on a $/gallon basis near the 20,000 gallon consumption point. The more you use, the cheaper it gets – up to a point. This is explained by SAWS’ highest-in-Texas water delivery fee. If you are a frugal water consumer, you pay more per gallon than your profligate neighbors until those neighbors exceed 20,000 gallons or so. For the record, that highest in Texas fee has gone up 69% since 2015. It went up 9.7% last year alone, from $11.64 to $12.77. P.S. SAWS also has the highest-in-Texas sewer fees, and they’re going up another 8% this year. If you’re not convinced, look it up. The comparisons with other major cities are in the Water Policy report on the city web page, and the actual increases are in the published ordinances. Actually Kirk, that’s not true – due to the complexity of SAWS bills . I thought those numbers seemed low. The rates you cite are only the Water Delivery rates and are only a part of the story. That page from SAWS omits the Water Supply rates, and the Water Supply rates are higher than your cited Water Delivery rates. (Notice a trend in clarity from SAWS yet?) You can check this by looking at the back of your SAWS bill. The actual cost per 100 gallons is the combined total of Water Delivery + Water Supply. 20,199 = 0.4809 + 0.6756 = $1.1565 per 100 gallons. Oh, and that higher rate, the Water Supply rate, it’s going up 4.3% in 2019 to go along with the 8% sewer. Supply is also slated to go up between 40-50% in 2020. Don’t believe me? Read the SAWS budget and do the math. Thank you for this report. Will RivardReport write one focused on CPSEnergy’s assistance programs (or did I miss it?)? Good to see that SAWS is reaching out more to us, and making the universal application available soon. The “rate increases” for 2018 were not 5.8%. They were 9.7% for water delivery, 4.5% for water supply, and 3.6% wastewater. For 2019 they are: 0.4%, 4.3% and 8.0%, respectively. The values cited by SAWS are actually “bill impact” values for a fictional average user. If you use a different amount of water or sewer, then your “rate increase/bill impact” will be different. In almost every usage case, the actual bill impact is higher than SAWS claims.